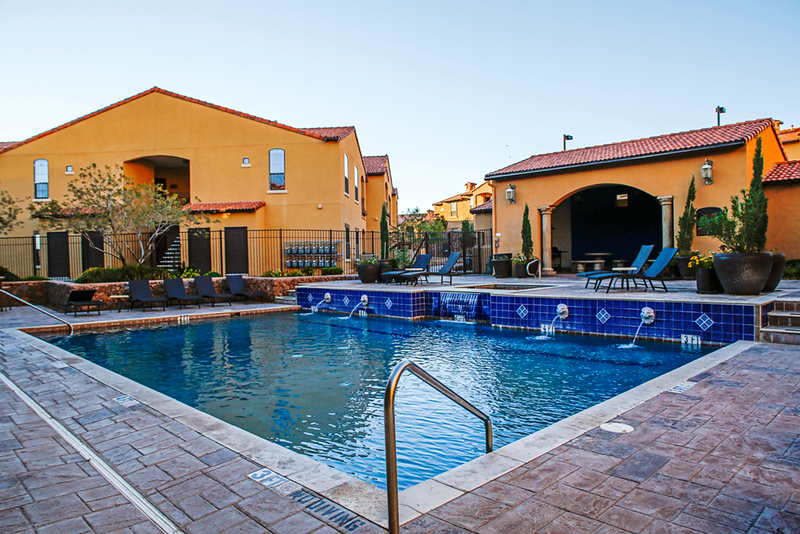 Tuscany at Mesa Hills is a Class A apartment community located in El Paso, TX. Built in 2007, Tuscany at Mesa Hills is comprised of 369 two story garden and townhome style apartments. The unit mix is approximately 32% one-bedroom, 50% two-bedroom, and 18% three bedroom units. The property is individually-metered for electricity, and water. Consisting of 55 residential buildings constructed of wood with painted stucco, Tuscany at Mesa Hills spans 33.95 acres with a combined gross building area of 381,228 square feet. All buildings have pitched tile roofs and all units have individual HVAC and hot water heaters. Common area amenities include a cabana with a swimming pool, spa and sundeck, barbeque grills with picnic areas, tennis, basketball and volleyball courts, playground, fenced pet area, movie theater, state of the art clubhouse with Wi-Fi, a fitness center, business center, conference room, package receiving, gated access, courtesy night patrol, 369 covered parking spaces and garages , and 326 uncovered parking spaces. Unit amenities include ceiling fans, microwave, washer and dryer, dishwasher, spacious closets, gas range, private patio or balcony, fireplace, and and some units include attached garages. A separate leasing office is located on the east side of the property. Tuscany at Mesa Hills has good visibility from it’s wide frontage along Mesa Hills Drive. El Paso, Texas is an ideal secondary market located on the border of Ciudad Juarez, Mexico and is Texas’ western most city. The property is situated just off Interstate 10, which runs through El Paso, Texas and has direct access east through San Antonio and Houston to Florida and West through Phoenix to Los Angeles, CA. There are several schools located within one mile of the property, along with 2 shopping malls, multiple grocery stores, and Providence Memorial Hospital all within close proximity.